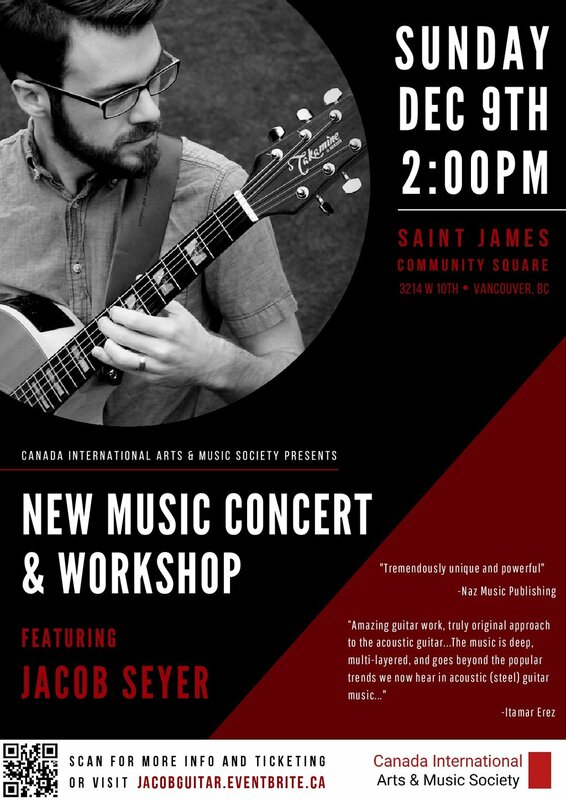 Featuring a concert of original music from Jacobs new full-length album “Migration,” followed by an interactive workshop, this event will excite and educate the Vancouver community on many of the innovative new techniques in guitar composition and songwriting today. We invite all music-lovers to this exciting event - if you wish to participate in the workshop portion, we advise that you bring an acoustic or classical guitar and have between a late-beginner and advanced level of guitar experience. Jacob Seyer is an internationally acclaimed acoustic guitarist and composer, having seen success with his work across the US, Canada, and South America. Since graduating in 2017 with a Masters Degree in Guitar Performance at the University of British Columbia under Dr. Daniel Bolshoy, he has filled his schedule with teaching, volunteering for local and international music non-profits, and producing transcriptions of his music in collaboration with Naz Music Publishing Inc. With an exciting and fluid aesthetic as well as an extensive grasp of guitar technique, his performances of instrumental guitar music are progressive, energetic, and introspective, blending elements of modern percussive guitar, contemporary classical and jazz, and various folk musics. For more information, visit http://www.jacobseyer.com or follow @jacobseyerguitar on Instagram!